First of all, we would like to thank you and express our appreciation for having such an honorable opportunity to introduce this event to you through this e-letter. 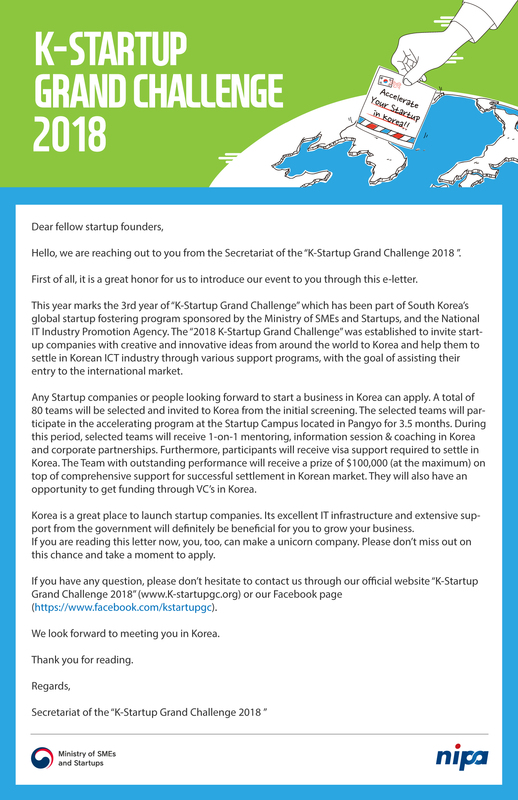 K-Startup Grand Challenge was established to support international startups with creative and innovative ideas to successfully establish their businesses in Korean market, and furthermore to excel in global market. Competitors will be invited to Korea and they will be supported fully through our various support systems. Startup entrepreneurs whom are already operating their businesses in the fields of Artificial Intelligence, Block Chain, Fintech, or any other entrepreneurs who are envisioning themselves launching businesses in such fields are all welcome to join our competition. Korea, among all country is remarkable in terms of establishing optimized environment for opening startup businesses. With the complete support from Korean government and Korea’s exceptional IT infrastructure, we believe that your startup will become successful in any fields. For these reasons as the secretariat of “2018 K-Startup Grand Challenge” we would like to share our posters and leaflets regarding with the information of the competition if you are interested. We look forward to promising entrepreneurs to participate in this competition and hopefully not missing out on any of these great opportunities. And here we are sharing with our community and fellow startups the leaflet and brochure of this important and worthy competition.